Did You Know? 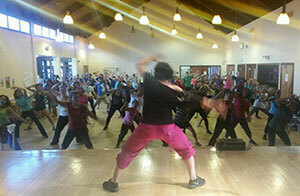 Upper Noe has free Zumba every Tuesday from 5:15 to 6:15 p.m. ? Drop in and Dance Yourself into Shape! On-site registration for programs at Upper Noe begins December 13 @ 10:00 a.m. See the daily schedule of Upper Noe programs and registration info. Baker John regrets that he will be unable to continue teaching food courses. His departure is a blow to a fine program of food preparation courses that he developed over the last two and a half years. Petite Bakers will absolutely resume in winter session with a new teacher. There is hope that a full selection of food courses will resume soon. Future Chefs has been unaffected and remains on schedule. 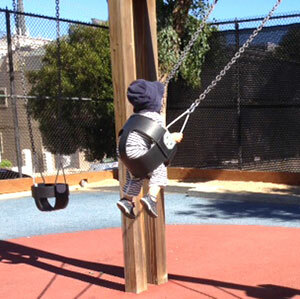 Upper Noe recently received new baby swings. The new style is much safer, holding children more securely. 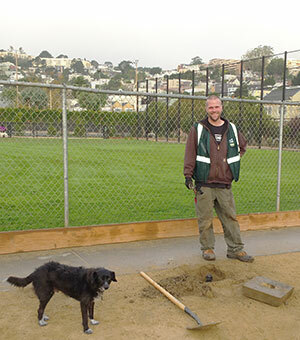 Our hats are off to Rec & Park maintenance. They replaced the old ones at the first sign of wear. On October 1, Mayor Ed Lee and Rec & Park General Manager Phil Ginsburg launched free Wi-Fi connectivity in 32 city parks. Google and the San Francisco Citizens Initiative for Technology and Innovation provided the support necessary for the Wi-Fi in Parks project. Now it will be easier to catch up on your work while catching some afternoon sun, doing some online shopping while minding tots in the playground, or downloading info while debating in the dog park. The improved service should also come in handy when program registration rolls around since onsite computers are limited. Bring your laptop and connect into Rec & Park’s online registration directly. The plants on the west side of the building had been looking rather shabby, especially the Native Plant Garden. So, on Saturday, September 13 the Ladybug Gardeners offered some much needed love and care. To manage the natives, Friends struck up an alliance with our good neighbor and environmental educator Markos Major of Climate Action Now! Markos expertly directed pruning and weeding to ensure that the garden stays true to its ecological mission. Unlike cultivated gardens, dead material on natives should not be cleared or topped. Their seed heads remain as food for the birds. Of immeasurable help on this day was our new RPD gardener, Dave. He brings years of professional experience to our traditional gardens and a passion for his trade that is remarkable. He and the rest of the gardening team have whipped the park into shape quickly. The beds and plants are so well maintained that the Ladybugs can step back again and focus on specialty projects like the natives and smaller gardens. 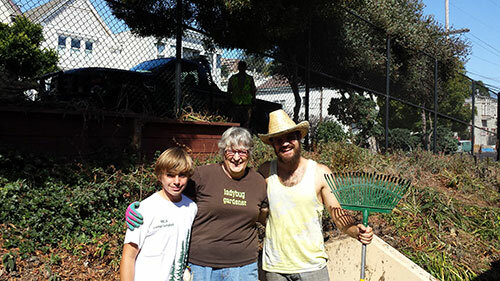 As Ladybug Leader Joan Lionberger remarked, “The place looks so good that I don’t know what we need to do next.” But she will figure it out quickly before the next Ladybug work day, Saturday December 13 from 9 a.m. to noon. Come by and volunteer, even if you only have an hour to spare. It’s a fun way to spend the morning. The Upper Noe Community Recreation Council / Friends of the Noe Valley Recreation Center are looking forward to hosting more events. On the table for consideration this year is a school fund-raiser, a community party, movie nights and an Easter Egg Hunt. If this sounds like fun, please consider offering a helping hand. Last year, Friends held a successful History Day event in May and stepped up to host the Easter Egg Hunt at Douglass Playground in April. These wonderful events touched all ages. This year, it seems fitting to bring the Easter event to Upper Noe. It will take some vision, coordination and commitment to make it happen. Many hands make light work, so be quick like a bunny and volunteer. Our next meeting is Wednesday, November 19 at 7 p.m. at the rec center. 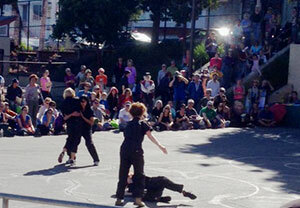 On October 18 – 19, the 11th Annual San Francisco Trolley Dances Tours came to Upper Noe. On Friday, this mobile troupe delighted schoolchildren who surrounded the outdoor basketball court to see the unique moves. Then, on Saturday, the troupe took it to MUNI, performing all along the J-Church line from Church Produce all the way to City College. A free dance party brought over one hundred participants to the Upper Noe auditorium on October 5. Several instructors were on hand to introduce themselves and to kick-off a series of free Zumba classes every Tuesday from 5:15 - 6:15 p.m. at Upper Noe. Our local engineer, Nancy, has been busy making Joby’s Run more comfortable, experimenting with solutions to soften our exposure to the sun and wind. Recently a new wind-break was installed and umberellas have been popping up in various configurations. Thanks Nancy fo all that you do for us. Meanwhile, our new gardening staff is doing some engineering work of their own. The irrigation system that keeps the place fresh and sanitary has been a vexing problem; gravel gets packed in around the sprinkler heads clogging and jamming them. Gardening Captain Jason Mueller and his team recently worked out some unique solutions in short order. You will notice that the concrete blocks surrounding the sprinklers on the perimeter have been lifted above the surface. We are already seeing a more even pattern with almost no muddy spots. Thanks team!